When Twitch started to climb in popularity, we couldn't have imagined all the places it would eventually go. One of those? All 403 episodes of Bob Ross' series The Joy of Painting. It was a weird decision and kind of a huge risk for a platform primarily concerned with streaming videos of people playing and talking about video games, but the purpose of it was to officially launch a new branch, Twitch Creative. And that risk turned out to be a huge success. Twitch worked with Janson Media and Bob Ross Inc. to make the stream happen, and, just over a week ago, the beloved painter's work started lighting up screens all over, reaching up to 138,000 viewers at once across 5.6 million unique viewers, according to GamesBeat. The total view time across all viewers ended up at 545.9 million minutes – just a hair short of 1040 years. That's a lot of very happy little trees. This is a bit of a strange path for the site. Twitch was initially spawned by the more general streaming site, Justin.tv, and quickly outgrew and absorbed its parent. Now it's spawned a branch opening room for people do to things on the network other than just stream games. 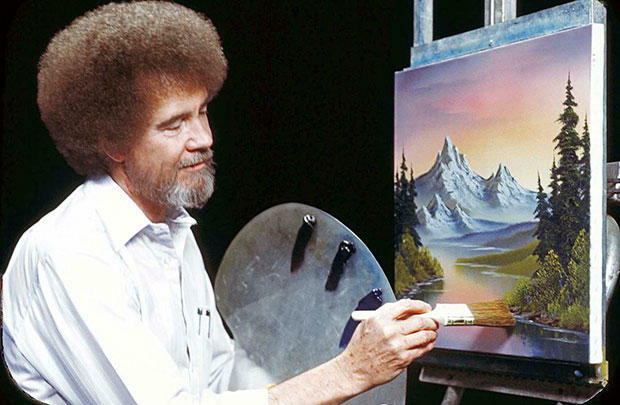 With the success of The Joy of Painting's initial stream, Twitch has announced that its creative branch will start streaming – alongside anything else users can get going – more Bob Ross, giving the painter a block from 3 p.m. to 9:30 p.m. Pacific Time each Monday, sending a portion of the proceeds to an arts organization and a cancer research organization.